When I first started running, in 2008, it was a solitary experience. I didn’t know any other runners, and even if I had, I would have been nervous to run with them because I was a newbie. I did all my running by myself. I was training for the Ogden Marathon relay. I was on a team of five that would split the 26.2-mile race, and I had the longest leg—the first seven miles. I was in fairly decent shape. I worked out regularly, doing classes at the gym like kickboxing or spinning. But I was not a runner, and the thought of running seven miles scared me to death. I discovered running paths around my home in Syracuse, Utah, and began logging miles there. Then I learned about the Ogden River parkway and started running along it. I was always self-conscious when I passed others on the trail. I just knew they would see that I was a fraud, that I was only pretending to be a runner. I just wanted to get the relay race over with so I could return to my non-running existence. The day of the race changed my life in completely unexpected ways. The energy at the start line was like nothing I had experienced before. The run itself was gorgeous; the seven miles ticked by quickly. I was surprised by how much I enjoyed it. Later, at the finish line, I cheered on the marathoners, half marathoners, and relay racers completing their feats. Goosebumps covered my body; I had a lump in my throat; tears spilled down my cheeks. I decided in that moment that I wanted to run a marathon. I wanted to feel that finish-line magic for myself. In 2009, I did just that, running the Ogden Marathon in May and the Top of Utah Marathon in September. I was officially a “Real Runner.” I had accomplished this awesome thing, and no one could take that from me. But I was still, for the most part, running alone. I had a couple good running friends, one of whom was my sister. But she lived in another county, so we couldn’t run together regularly. And then my other two friends moved out-of-state. In 2014, as I ran the Big Cottonwood half marathon, I noticed a guy ahead of me wearing a shirt that read “Ogden Pub Runners” across the back. I was intrigued. Running and drinking? Sign me up! I started following them on Facebook to see when they met. I worked nights at the time, so it wasn’t until the spring of 2015 that I was finally able to make it to one of their runs. It was a beautiful April evening. The run was at Andy’s Lounge in Harrisville. My friend Jennie came with me and we joined the group of strangers for a three-mile run around a local college campus. Afterward, we ate, drank, and socialized. I immediately knew I had found my tribe. I started running regularly with OPR. 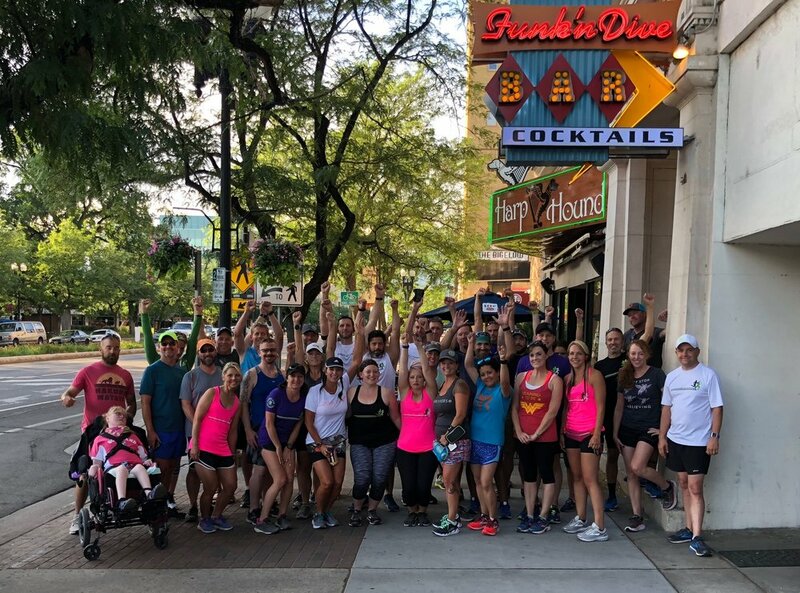 Aside from the weekly run, many of us would organize group runs on the weekend. I went from having no running partners to having a slew of ready, willing, and crazy running buddies. It definitely made running and training a lot more fun. I have learned that there is a camaraderie among runners. We understand each other in ways that non-runners do not. Talking openly about bodily functions is one of them. It’s not at all unusual for this particular topic to come up quickly and often, creating an instant bond between strangers. Throw in a few beverages of the alcoholic variety, and you have yourself some epic friendships.I have run an ultra-marathon, numerous marathons, half marathons, and Ragnars with these friends. We’ve run in other states; we’ve conquered Bryce, Zion, and the Grand Canyon; we’ve climbed mountains together. Some of us have matching tattoos that we decided to get when one of us (who shall remain nameless) got a wild hair after we ran the Idaho Wine Run. We have had some incredible adventures. But we’re more than just running friends. We have playdates with our kids; we go to movies, carve pumpkins, and have epic crawfish boils. We celebrate our kids’ marriages; we mourn when we have deaths. When someone is having a tough time, we help them out. We bring meals, we listen, we comfort, we support. We are a family, and we look out for each other. At a recent board meeting, I was startled to discover I am currently the VP of Ogden Pub Runners, and next year I will be the President. Me. The girl who hated running in high school; it was literally my punishment for being late to band practice. And now I have this amazing opportunity to have even more adventures with these people so near and dear to my heart. My tribe. My OPR.